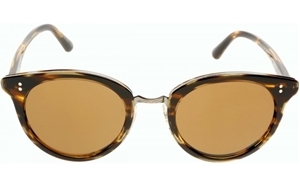 OLIVER PEOPLES SPELMAN IS A UNISEX FRAME IN A ROUND 50'S STYLE. A MIX OF HIGH QUALITY ACETATE WITH ORNATE METAL DETAILING. The Oliver Peoples Spelman OV5323S is a Unisex style rounded 50'S frame. The quality of design and manufacture that OLIVER PEOPLES is famed for is evident throughout this round 50's vintage inspired frame. The Exclusive Oliver Peoples core wire in the sides and coin edge core wire trim around the whole of frame. The Spelman is an ideal his n hers frames avaialble in traditional Oliver Peoples colorways and exclusive limited edition finishes. The Oliver Peoples Spelman OV5323S comes with its own branded case, cloth and packaging, and covered by the 2 years no quibble guarantee.